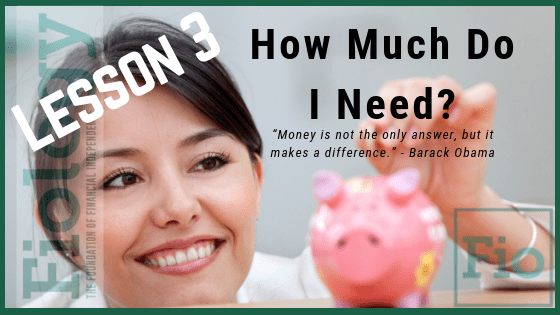 How Much Do I Need to Become Financially Independent? The traditional investment advice of save 10-15% of your income until you are 65 and you’ll be able to do with your money and your time as you please just doesn’t cut it for those of us who want more out of the brief time we have here on Earth. We strive to achieve Financial Independence so that we can control what we do with our time as much as practically possible. Once we determine Financial Independence is the right journey for us, we need to determine the amount of assets needed to provide income for expenses during the Financial Independent phase of our lives. Read: Two Great Online Retirement Calculators by J.D. Roth of moneyboss.com. Select one or more of the calculators mentioned and explore. Input a variety of assumptions to gain an appreciation of what factors can significantly impact your retirement planning. Take Action: Estimate your current annual spending and compare that with the expenses you anticipate needing in Financial Independence. Determine, using a trusted retirement calculator, how many years you believe it will take you to reach the value of assets needed to support your annual expenses. The numbers will change during your journey to Financial Independence. The important thing is that we set goals and immediately begin achieving them.